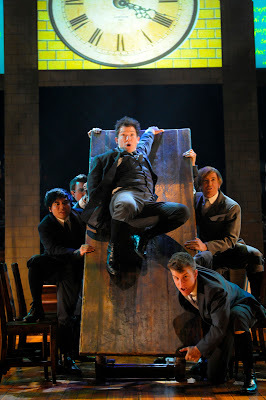 Shown Left: Jason Hite as Melchior and Eryn Murman as Wendla in San Jose Rep's production of Spring Awakening. DH and I just saw the San Jose Repertory Theatre's performance of Spring Awakening. <SPOILER ALERT> For those who don't like spoilers, you should not read this review, as there will be spoilers throughout. Just won't be possible to explain what I loved about the show without giving some of the story away. Definitely not a play you'll see any T-Party candidates attending, unless picketing out front counts. Having heard the songs, though, and with our oldest child entering puberty, I wanted DH to come see it with me, so he agreed. And boy, was he glad he did! The first scene, first song, "Mama Who Bore Me" won us over immediately. Very much an ensemble show, the female leads sang like angels--clear, melodious, and harmonious. That is, if angels stomped around on stage in boots, pulling up their nighties, and, umm, "mastering their domain" as Seinfeld would have put it. Despite the suicide that we knew was coming mid-play, the show surprised us with its exuberance. We expected it to be dark and gloomy, full of teen angst. There was still plenty of angst, but much of the staging and lyrics were funny, or at least ironically witty. There were amazing uses of set pieces as part of the dance routines--seeing how they use the table in "The B_tch of Living" was worth the price of admission alone! I loved the interplay between Georg and the Adult Female in the song, "Totally F_cked", and I know I'll be hearing that song in my head for years to come, whenever I am feeling stressed. Most of the show is set in 1890's conservative Germany, but the music breaks away into modern rock. I found the use of the songs exclusively for interior monologue to be insightful, allowing us to hear their thoughts, but not interrupt the storyline. I also found interesting that all the teen characters are unique in personality and challenges to overcome, while all the adult roles (parents, teachers, administrators, doctors), were played by the same two people: one each for Adult Male and Adult Female. It really reinforced the teen perspective of all grown-ups being the same. And there are no songs from the adult perspectives, hence no getting inside their heads. This is definitely a teen anthem show! We noticed a younger audience block in attendance. All the performances were wonderful, which is required for such an ensemble piece. I loved Cindy Goldfield's first scene, as Wendla's mother trying to explain the birds and the bees to an eager daughter. It was thrilling to see Lowell Abellon again as Georg. He co-starred in the World Premiere of The Kite Runner, written and performed here in San Jose. The two leads: Jason Hite (Melchior) and Eryn Murman (Wendla) were amazing, of course! He reminded me of Matt Damon in Good Will Hunting. The play itself brought both Our Town and Dead Poets Society to mind. The graveyard scene in the former, and the school setting with rebellion in the latter. I thought much of the staging of the songs was as creative as in Chicago, but with less glitz and glam. There was a live 7-person band on the the back of the stage--a refreshing change from the orchestra pit where you can only see the tops of their heads. Reader Little Drummer Girl will appreciate that Ms. Kelly Fasman played drums--and rocked the house! One of our favorite things that San Jose Rep does is put out a study guide with more detail on the play, and the topics covered. This is always a great read before or after the show. Whoever does this -- you're doing a GREAT job. Even if you don't see this play, any parent with teens entering puberty might appreciate reading this document--click here for the PDF. WARNING: Content is graphic! I loved the cartoon on the bottom of page 10: "Never connect without a firewall". So appropriate for Silicon Valley! And the explanation on page 8 of teen brain development was illuminating. Teen decision making is ruled by the amygdala (emotional center) at this age, and not the prefrontal cortex (rational thought) as in adults. This explains quite a lot about our middle-schooler's behavior recently! We enjoyed the show so much, despite the dark themes, that we're checking our piggy bank to see if we can afford tickets to see it again. If you can manage it, and the mature themes don't turn you off, I *highly* recommend this show! We have so much on our to do and to buy list right now that Theatre just isn't in the budget. But this was a very good review. Thank you for sharing. heeey what's with the hate against people who like the constitution? Wow, I had to read the whole review again 3x before I could figure out what you were talking about LGG! Without straying too far off into politics, I don't think that there was any hate expressed for any groups. That being said, I agree with the thought that most folks who consider themselves pretty politically conservative won't likely feel very comfortable with Spring Awakening's in-your-face treatment of many issues of sexuality in a repressive culture. As for the Constitution, I'm just pleased as punch we have one that protects works of art as thought-provoking as Spring Awakening! Hey LGG, no hate intended. But you are right, a strict constructionist interpretation of the constitution does not have to mean socially conservative. I do tend to lump the two groups together, and that may not always be accurate. Thanks so much for the plug for the Study Guide. As the person who writes all of the Study Guides here at San Jose Rep, I'm glad to know that they are being used and enjoyed. Karen, I had to reply to your comment and thank YOU--I'm not sure how long you've been doing them, but we have been thrilled with the study guides for the several years we've been season ticket holders at the Rep. We look forward to them and get to the theater early to get a few extra minutes with them. We find they really enhance our enjoyment of the stage productions. Keep up the great work, and thanks again (and yes--we just got tickets to go see Spring Awakening _again_ on the last weekend of the show; our first time ever coming back for a second viewing at the Rep!)! Yes, Karen, so glad you found my post! We love those study guides--keep them coming!